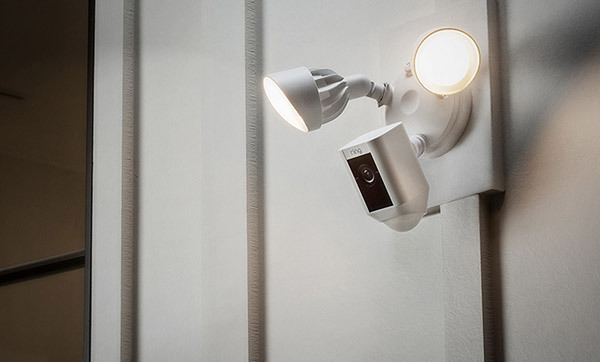 Ring, makers of the popular video-enabled and app-controllable doorbell by the same name has today announced a new motion-activated floodlight, called the Floodlight Cam. As with the doorbell with which the company made its name, Ring’s Floodlight Cam does more than just light your garden up, though. The light itself is provided by two 3K lumen LED floodlights and the unit features a 270-degree field-of-view, facial recognition so you know who is prowling around and a 110-decibel siren to sound the alarm if required. There’s even two-way audio to enable homeowners to speak with whoever is outside their property, and everything’s night vision-capable to boot. As you might expect with a product of this ilk, the Floodlight Cam sends a push notification to users when motion is sensed, and it’s at this point that the camera starts recording. The free Ring app, available for all major platforms, allows users to speak with the person outside and the whole thing can be controlled via WiFi and a smartphone app. Ring is already accepting pre-orders via its website (ring.com) for the Floodlight Cam at $249 a piece, with units beginning to ship to buyers in April. The truly security conscious will also want to take advantage of Ring’s cloud video recording option, allowing them to view and download up to six months of previous events for $3 per month or $30 for the full year. You can read through the full technical specifications, taken from the official website, below. Why would anyone spend $249 on just this?? ?